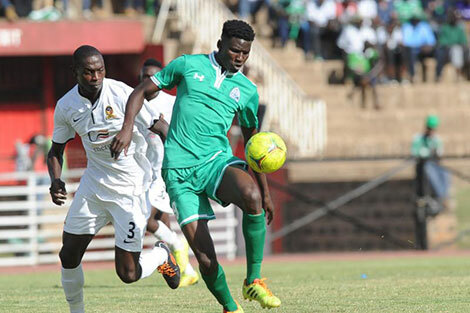 Gor Mahia striker Michael Olunga, who scored a hat-trick against Botswana in the Olympics qualifiers has been touted as Kenya’s next great hope in the striking position. Former Harambee stars coach Jacob Ghost Mulee touted Olunga as having the attributes needed. “Olunga is good, strong and can link up with his team mates well. When given space he can be hard to deal with. He is also intelligent and technically gifted; I think Kenya has a gem here. I have watched him at Liberty and now at Gor Mahia, the boy is a talent,” said Mulee. Stars coach Bobby Williamson was also effusive in his praise for Olunga. “We missed Olunga in the first leg against Botswana, he usually gives us a different dimension when in the team, and I think it would have been different suppose he had played in all the two legs. He has an aerial threat and he motivates other players, he has the potential to be one of the lethal strikers,” added Williamson. Other Gor Mahia players in international action include Dirkir Glay who has been called up by the Liberian national team coach James Debbah. Fans of that era will remember that when Kenya beat Liberia in a world cup qualifier in 1989, the key Liberia players were George Weah and James Debbah who has now called up Glay. And it was former Gor Mahia ace George Onyango “Fundi” who scored with a brilliant grass cutter as Kenya beat Liberia 1-0. Khalid Aucho was also called up to the Uganda Cranes side that will play Gambia in an international friendly. Gor Mahia are said to be pursuing Rwanda skipper Jean Baptiste Mugiraneza who has been a regular in the Rwanda national side. “Gor Mahia is closing in on Mugiraneza who is a very experienced striker both for his club and country. We want to establish a team that would both the league and continental assignments that is why we sort the player because he fits in our plans,” the source who sort anonymity told supersport.com. This is a surprising turn of events considering that earlier, Gor Mahia were said to be keen on re-signing Dan Sserunkuma. Gor Mahia are also said to be close to signing Paul Were, the speedy former AFC winger who has been in South Africa for the past 6 months. “It has been trying time for me in my time at South Africa. I found it rough and even in the last minute I had no money and my colleague at Amazulu Papy Fatty had to come to my assistance so that I could travel back home,” he added. According to supersport, Were who recently returned home to Kenya has been negotiating with Gor chairman Ambrose Rachier hoping to get a shorter six month deal so as to improve his chances of going back abroad but the defending champions have insisted that he signs a one year deal. With the Almighty God guiding Olunga he will visit place, I wish something can bring back the late Len Julian back to teach Olunga technic of scoring and give defenders headache.On Transfere please the Chairman DON’T sign any Player less than one and ahalf years however good he is. Just imagine Sopapaka pocket cool 24million on Abdul Rashak,but at Gor players are leaving freely, no way Bwana Chairman? That’s true bob, but remember that we have CECAFA, Top 8, GO TV and to defend the KPL. When we win the KPL, we have the continental assignments from Jan 2016. I think Gor have many young players even under 19 is still GOR MAHONO. Yesterday I was a mazed by Sport report at K24, by the name Tony Kwalanda, ati Gor also has problem like AFC Leoprds, that the Officials of GM, did ask the DP to pay for them Airtickets to Kisumu to honour Match between them andTusker.Tony Kwalanda should know 1) GM has got Club Bus 2) If your are broke as he intend to put it, should you ask for Airtickets or for Cash???. Most of Luhya Community working in the Media whenener they want to report the problem of AFC Leopards, they must bring GM, on the same picture. Tony Kwalanda the DP, associates with Champioms not Food mongers NOTE that PLEASE!!!!! Looking into the objectives of the club for continental impact, I think it is wise to have players who are established hence tying them for longer contracts. In this way the so called younger players will have the opportunity to learn the ropes within an experienced squad. They will learn the fighting spirit to even make it to the bench. But if you have people of the same calibre, they would tend to do the same things all the time. Do not play safe on the bench but play it hard. @Achacha, nostalgic feelings are good but on the practical side some may just remain as wishes. Len Julians did his part and left, somebody like Olunga may not even have seen him. But in the continuity of time, things are different and we thank God for new people like Frank Nuttal,the technical bench and the EC who are doing best for the Team. Our part is to give them unwavering support at all times as we see Kogalo growing to greater heights. Waaah! yeah,danny is out of form. Mmmh…mambo ya makate ilifika wap lakn? may adm atufafanue zaidi,coz 2nadoubt.. okei.. let as sign only 2-3 players ama niaje?,l thnk dat namba ni poa. ok! Gor Biro Bread, is secret tool for the Chairman and his Committee as they Salaries because so many quetions has been asked about the Bread but NGOOO, who are you to know about the BREAD???????. Next time we are going to ask the Person who Lauched that Bread on his website, proverbly we may get the Answer from him (RAO)? Before thinking of a player lets think of the teams needs. As we stand do we really need Were? I say no. Why? Were is a player who dribbles from the left n cuts inside thats traditional football if u ask me. He is not adaptable n is of questionable character. We need humble players who are ready to learn. Can he learn? I guess not otherwise ange pata chance huko South Africa. Can he warm the bench I dont think so. His ego is too big for that. I think A.F.C needs him more. I realy support you on this, there’s no difference between Were and Inno. Wafula, why have two players play alike? NO NEED!! Dan Original I concur with you. We need a strong and vibrant AFC Leopards to keep us on our toes. I hope they will sort out their problems sooner than later. I do not understand why Kogalo and Ingwe can not get get sponssors. Regarding Were, I think we need him. Currently we may Boast of only one natural winger, Wafula. In the absence of Nzingirimana and Siboamana, we will lack natural wingers who can cross balls to the the likes of Kagere and Olunga. That is where Were will come in. Were can terrorise defenders when on form. All in all , let the technical bench do what they think is best for the team. By the way how many points did Kogalo have at the end of the first leg last year? where is this retard dead-walking man called Ingo with his filthy posting, as Ingwe is being ravage by haeorhagick diseases. He cannot stomach how Gor is on fire. I know he will re-appear with something funny, weird creatures. Dan Original I concur with you. We need a strong and vibrant AFC Leopards to keep us on our toes. I hope they will sort out their problems sooner than later. I do not understand why Kogalo and Ingwe can not get get sponssors. Regarding Were, I think we need him. Currently we may Boast of only one natural winger, Wafula. In the absence of the two left backs, we will lack natural wingers who can cross balls to the the likes of Kagere and Olunga. That is where Were will come in. Am better off with Agwanda Enock than Were Jokanyanam !!! Kwani huyo Jama wa Ingo (Kimanzi), haja wachilia Job, I heard that Mr. Timbe of Sopacat is worming 4 that Job? Dan oh Dan please confirm this – 4.3 million in Kisumo? If its true then to hell with the thieves of Nairobi. If you asked me, both Agwanda and Were would be useful additions to the squad, why? We need depth for both domestic and international competitions; and remember longer contracts, nothing like six months – we want a strong statement made to all Africa at the CAF Champions tournament next year. The problem is that Nairobi fans think they are entitled to watch Gor for free. Hope we can also add Aboud Omar who just got raleased by Tusker to bolster our bench bt i guess the TB knows better!